Lock in a great price for Loboc River Resort – rated 8.9 by recent guests! Beautiful setting on river, liked the architecture of resort-ustic natural materials, nice craftsmanship. Favorite activities - firefly tour and stand up paddle boarding on the river. Wonderful staff - especially our guide Jun! Everyone and everything was excellent. Salamat for wonderful stay. Loved the location right on the river. The food in the restaurant was good. The rooms were clean and the staff were helpful. Beautiful area and the restaurant served good food. I cannot say enough great things about this place - the grounds were beautiful, the restaurant was delicious (amazing free breakfast! ), and the staff were extremely friendly and helpful (Joanna is the best!). They had motorbikes for rent and we took them to the Chocolate Hills! This place is a hidden treasure. The staff were extremely friendly & attentive, the rooms were big, airy and very comfy, the pool was perfect and the food excellent. I have nothing bad/negative to say about Loboc River Resort. This place is on a river in the forest so expect, ants, bugs, lizards... but the monkeys and fireflies were a bonus. Very nice resort in Bohol, original concept because it is on a river and for once not beside the beach. The staff is very nice, smiley and ready to fulfill your requests. The restaurant is not overpriced and the food is great, very good complimentary breakfast with a choice between European and Filipino food. The room was comfy, with a nice view of the river. The hotel proposes some tours, with reasonable prices. You can also rent a scooter there for cheap. The pool area is also clean and really nice. We had a very good stay! Loboc River Resort This rating is a reflection of how the property compares to the industry standard when it comes to price, facilities and services available. It's based on a self-evaluation by the property. Use this rating to help choose your stay! Sitting on the banks of the Loboc River, the Loboc River Resort offers rooms that combine wood and local materials with modern comforts. It features a restaurant, bar, and souvenir shop. Loboc River Resort is a 45-minute drive from Tagbilaran Airport. It is 20 minutes’ drive from the Loboc Tarsier Sanctuary. Attractions such as the Zoocolate and Danao Zipline can be reached in 15 minutes by car. Offering garden or river views, the air-conditioned rooms come with private balconies and cable TV. Each room has an private bathroom with a shower. Some rooms also include a kitchenette and seating area. Guests can enjoy a relaxing massage at the resort. Staff can arrange boat rentals and activities like trekking and firefly watching. Car rentals and laundry services are available. Local and international dishes are served at the restaurant and bar. The Floating Restaurant is a 10-minute drive away. This property also has one of the top-rated locations in Loboc! Guests are happier about it compared to other properties in the area. This property is also rated for the best value in Loboc! Guests are getting more for their money when compared to other properties in this city. When would you like to stay at Loboc River Resort? Featuring a thatched roof and more space, this villa is furnished with wooden décor. This room is located directly along the Loboc River. This spacious villa features a seating area and a kitchenette. The bathroom includes a bathtub. House Rules Loboc River Resort takes special requests – add in the next step! Loboc River Resort accepts these cards and reserves the right to temporarily hold an amount prior to arrival. Wow what a beautiful place, also the swimming pool at night. It's very quiet place, a relaxed atmosphere! We really recommend this place in Bohol. Matresses are a little bit to soft. Staff in the restaurant is awesome. Rooms were clean and nice. The hotel is located directly next to the river, you got an awesome view. The hotel will organize you scooters for rent, massage etc. They charge 20USD to add an extra bed for our 4 years old son, and i felt it is was too much, esp given the price of the room is already quite "medium range": this created a 25% price increase only for a bed (even if comfy) and made the room quite pricey. Without this, i would have rated it 10. Amazing location on the river with beautiful views, nice garden full of beautiful flowers. Lovely pool by the river, very nice to relax after a day out. efficient and lovely staff, always ready to help: they were provided bikes, driver upon request very fast and with no fuss. Super child friendly as always in the Philippines. Comfortable beds, and nice terrasse overlooking the river. Better to choose a river view room. This place is absolutely amazing. I regret I have booked 1 night only. Big, clean and stylish rooms, very nice pool with river view, kind staff and amazing restaurant. We have rent a canoe for river trip and it was absolutely awesome. The restaurant staff was one of the least attentive staff who have ever served us. Long awaiting, sometimes visible ignorace while you were waiting to give order. Endless waiting for the food order, followed by many kitchen mistakes and average quality of dishes. This is the one, but huge 'no no' to that nice place. The reception staff, location, river view room, swimming pool. The whole hotel was amazing, and the best bed we have had in the Philippines. It was perfect 3 night stay. Ideal for those who want to have relaxed stay, surrounded by beautiful scenery. Very nice stuff, good food. Stuff helps to organise all needed excursions and transfers. Very cheep and good massage. We enjoied our stay very much! One of the receptionist was not really helpful, just focused on proposing us the hotel tours and not keen at all at giving information about what to do and visit nearby by ourselves.. I would say even slightly rude. However, Jude (another receptionist) was extremely polite, friendly and professional. The air conditioning was a bit noisy. The bed was a bit uncomfortable and the bathroom very basic but extremely clean. So, overall our staying was really pleasant and I will highly recommend a stay in this hotel! Great setting along the river Loboc. Swimming pool with a view on the green blue river, just beautiful. Stunning raised walkway between the trees to reach our bungalow. Cosy terrace with fairy lights on during the evening where to have breakfast and dinner. Good food at fair price.The staff is professional. I will highly recommend a stay in this hotel! Moreover, I really enjoyed the boat tour to watch the fireflies during the evening on the mangroves (I will suggest to improve it providing the tourists with a guide and diffuse the culture of respecting these incredible insects). Shower was not easy to use, the temperature was not stable. Otherwise very good. Big room. Comfortable bed and pillow. Big pool, with a river view. Really good restaurant, nice band for Valentine's Day. Staff was very nice. You can go feed the monkeys with the staff at 4.30pm every day. Good wifi. Amazing location, right on the river Loboc. Wake up to nature and wildlife. Large rooms with comfortable beds. 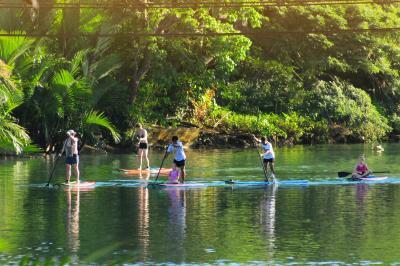 Paddleboarding and kayaking are always available during the day. Nice pool. There really isnt anything nearby (45 minutes to Tagbilaran or to chocolate hills), you're away from busy and touristy areas so it's just a really relaxing and beautiful place.